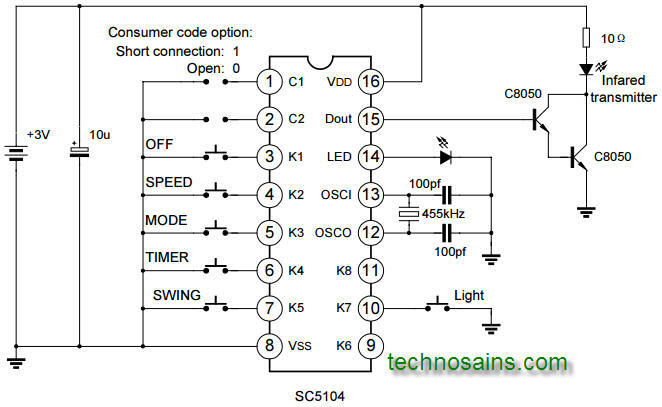 SC8206 is an electronic fan control IC, it use electronic touch switch and timer replace the traditional switch and timer. SC8206 improved nature wind and sleep wind mode expect hold the traditional fan functions, and improved a swing control and light control function. 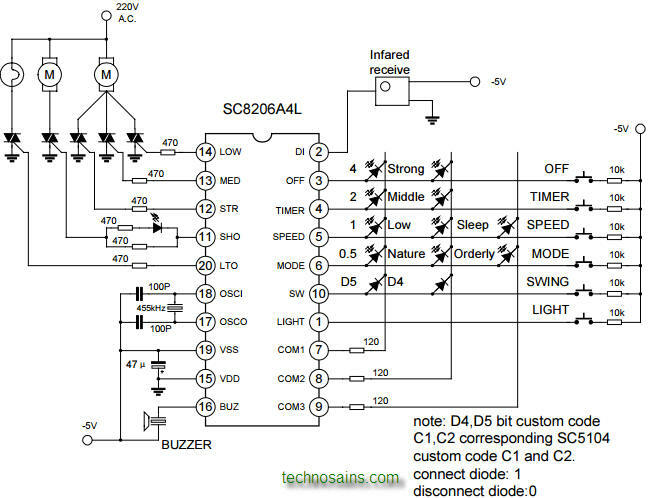 SC8206 cooperate with the SC5104 encode IC, implement the remote control of the fan. It start fan if pressed when fan is off. It turn on the fan with middle wind for increase start moment. After three second, it resume low wind mode, or the operation mode stored in the operating memory. This key set the operate mode when fan is on, if successive pressing of ON/SPEED key, it will operate as low wind, middle wind, strong wind, low wind, middle wind go along with cycle. wind, nature wind, sleep wind, normally, nature wind go along with cycle. A) Ordinary wind: the he wind speed is set by SPEED key and does not change as time passes. B) Nature wind: it is set in program, and operate with “SPEED” key, can produce strong nature wind, middle nature wind, low nature wind, simulate the really nature wind. C) Sleep wind: In sleep wind mode, the wind speed steps down automatically one level every interval, until it reaches low wind level. 1 If fan set in strong wind mode at first, it operate in strong nature wind for half an hour, then switch into middle nature wind, after half an hour switch into low nature wind, until the preset time end or turn off fan. 2 If fan set in middle wind mode at first, it operates in middle nature wind for half an hour, then switch into low nature wind, until the preset time end or turn off fan. 3 If fan set in low nature wind at first, it operates in low nature wind, until the preset time end or turn off. This key used to set the preset off time. Type mark with “A4” mean have four section time output (0.5, 1, 2, 4 hour) accumulated. Type mark with “N3” means have three section time output ( 1, 2, 4 hour) non-accumulated. When fan is in the time mode, LED will indicate the remain time, means the fan will stop after the display time. If pressed when fan is in the operate mode, it can control the fan swing, it is invalid when fan stooped.